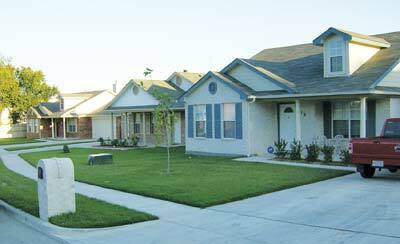 The TCHP-developed Toliver Acres neighborhood in Arlington. Tarrant County Housing Partnership works in collaboration with local and federal government, members of the financial community and corporate partners to deliver an array of programs and services that address the issues related to housing for special populations. Education and counseling: TCHP offers free counseling and workshops for first-time buyers and home owners in crisis on a year-round basis. Conducted individually or in groups, TCHP classes and counseling are led by certified professionals who provide guidance and information regarding mortgage issues, home repairs, foreclosure prevention and a host of other issues. Assistance for Spanish-speaking clients is readily available.Learn more. Affordable housing: Each year, TCHP funds the construction or rehabilitation of quality houses, which are offered at below-market rates to qualified low to moderate income buyers. Learn more. Down payment and closing cost assistance: TCHP administers approximately $1 million in assistance that makes homeownership a reality for low to moderate income families across Tarrant County. Learn more. We have counselors fluent in English and Spanish. If you require assistance in another language, we offer translation services through our relationship with Translation & Interpretation Network. Please contact us at (817) 924-5091 or counseling@tchp.net if you would like to access these services and we will contact the company on your behalf to arrange for a translator.